A senior figure in the controversial Kabbalah Centre - the sect championed by stars including Madonna and Demi Moore - seems likely to spark a storm of protest by saying Jews killed in the Holocaust brought their downfall upon themselves. The claim provoked outrage from Kabbalah scholar Rabbi Imannual Schocket, from Ontario, Canada. He said: "To me this is one of the most obscene statements anybody could possibly make." Genuine scholars of Kabbalah, which is a respected branch of ancient Jewish mysticism, reject the Kabbalah Centre as an opportunist offshoot of the faith with charismatic leaders who try to attract the rich and the vulnerable with the promise of health, wealth and happiness. The Holocaust claim comes in a secretly-filmed BBC documentary. One undercover reporter, who has suffered from cancer, went to the London Kabbalah Centre - a £3.7million building off Oxford Street - seeking help, and was offered a package of remedies for the disease for £860. The cost included nearly £400 for 10 cases of Kabbalah water, £150 for "extra-strength" water and £289 for Zohar books - the Kabbalah "bible". The Zohar is also said to have special powers which followers can benefit from by running a finger over the text as if reading Braille. A second investigator, who worked undercover as a Kabbalah Centre volunteer for four months, was told how the Kabbalah water worked, with a devotee explaining: "We start with the purest artesian water and then we do the various meditations, injecting energy into it." The Kabbalah Centre website explained that a process called Quantum Resonance Technology "restructures the intermolecular binding of spring water". The investigation discovered the water actually comes from CJC Bottling, a bottling plant in Ontario, Canada, which was the subject of a public health investigation in 2002 into how its water was tested. CJC was ordered to improve manufacturing techniques, though there was no suggestion that they ever sold polluted water. The film also investigates the background of the sect's founder, "Dr" Philip Berg, who is known to followers as the Rav. He enjoys a millionaire's lifestyle in Los Angeles. The source of Mr Berg's "doctorate" is not clear, but it is known that he was born Feivel Gruberger in New York, trained as a rabbi and worked as an insurance agent before deserting his first wife and seven children for second wife, Karen. 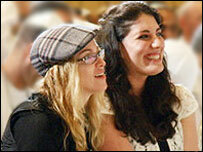 The couple then set up their first Kabbalah Centre in Tel Aviv. The lucrative marketing operation for the water, Zohar books, face-creams, candles, videos, and red string bracelets worn by followers came later. The organisation claims to have Kabbalah Centres in 40 cities worldwide and to be a non-profit-making organisation. The centre was asked about its views, including those on the Holocaust, and in a statement said: "The Kabbalah Centre has not seen the BBC programme and is unable to comment accurately on its content." Regarding fundraising, the statement went on: "As a registered charity, the centre has to fund raise to cover administrative costs and outreach work, the effects of which are felt across the world on a daily basis." The centre has launched a US$1m campaign asking followers to donate money so it can send its own brand of Zohar books and water to the victims of the Asian tsunami. In Israel, the authorities have refused to give the charity a certificate of proper management for three years running because of accounting inadequacies, and in Britain the Charity Commissioners have criticised the centre's accounts for "significant shortcomings in transparency".